Currently on view at the Stanford Art Gallery, “We’re Not in the Business of Warehousing Paper” is an MFA thesis exhibition showcasing works from five art practice MFA students: Einat Imber, Christopher Nickel, Felicita Norris, Daniela Rossell and Lauren Ashley Toomer. The exhibition is a melting pot, featuring ideas across different forms and media to address issues ranging from global communications to psychological boundaries. Process-wise, the works focus particularly on the materiality and texture of cloth, paper and other such surfaces. The aesthetic of the exhibit is as much about materials as it is about the drawings and paintings themselves. An entire wall of the gallery space is covered by a sea of irregular shapes, drawn and painted directly onto the wall using various tones and different media. Conglomerates of paint are interspersed with graphite and charcoal scribbles, highlighting the topography of the wall. Here, the gallery space becomes a part of the exhibit itself. Imber’s works, which focus on the materiality of burlap, are enormous and imposing. The main floor of the exhibit is dominated by his large-scale burlap boat, which is modeled after an origami paper boat. 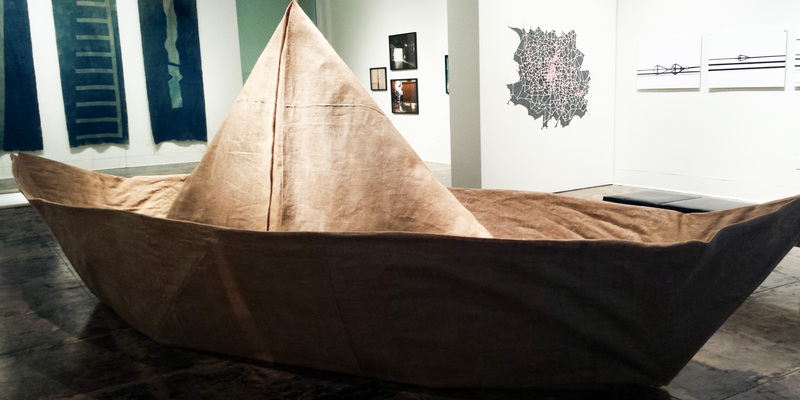 On the back wall of the exhibit, a series of four burlap banners hang downwards from the ceiling. Strings of frayed cloth stream down from the banners, which have been splashed with a blue gradient using a photo-sensitive cyanotype process. Imber’s process calls attention to imperfections and blemishes in the surface of the cloth, emphasizing its texture and how it contrasts with the sharp, geometric edges of Imber’s designs. Nickel combines images and sculpture to represent information and communications networks. Sculptures that resemble webs of nodes and edges — reminiscent of graphs or scientific diagrams — frame either side of a series of photographs. The prints show the contours of electrical wires on glowing white backgrounds, and they embody the physicality of virtual information networks. Other prominent works in the exhibit deal with the human figure in relation to different materials. 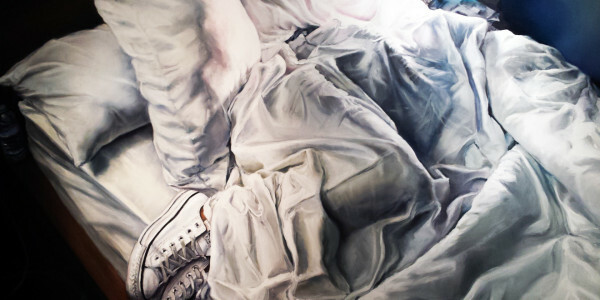 A series of paintings by Norris features bodies wrapped in various cloths and plastics. Norris’s works are visceral and dramatic, and give off the impression of being trapped or asphyxiated. Paper and cloth are used here as objects of constraint. Toomer’s work, entitled “Figures in Ground (Chroma),” is painted on a series of canvas scrolls laid out across the floor. Toomer’s colorful mark-making loosely suggests the presence of the figure on expanses of white cloth. She shows the body in various poses, making full use of negative space and the white of the canvas to construct her figures. “We’re Not in the Business of Warehousing Paper” follows up the excellent “Hi5” first-year MFA exhibition with another series of visually and conceptually stunning works. “We’re Not in the Business of Warehousing Paper” is on view at the Stanford Art Gallery until June 14.